Sorry guys,i know am posting since few days many dishes prepared with foxtail millet, its such a miracle grain i couldnt keep myself away from it. Here is one of our recent favourite, i prepared this comforting food yesterday for our lunch and this tastes marvellous when served simply with a spicy potato fry and fried chicken wings. Personally i loved this fantastic healthy dal bath with papads,definitely a healthy and fantastic twist to usual rice-dal bath. 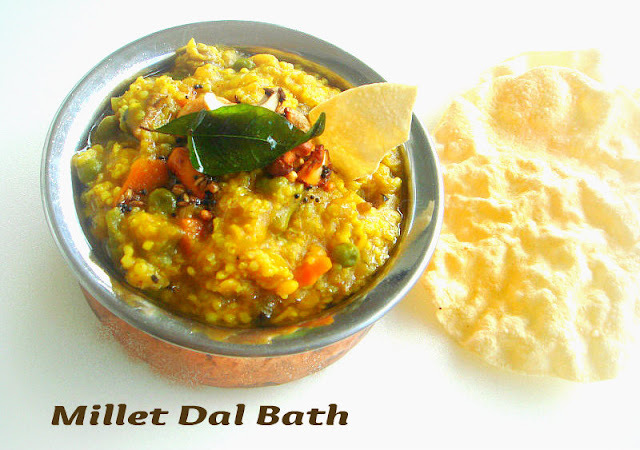 This super healthy dal bath takes hardly less than half an hour to get ready as i cooked them through pressure cooking. A quick,delicious, comforting and a super satisfying meal to enjoy without any guilt.Sending this healthy dish to CWS- Rye or Millet guest hosted by Simona..
Wash and soak the foxtail millet and dal together for 15minutes in three cups of water and keep aside. Heat enough oil in a pressure cooker, add the veggies and cook for few minutes. Add now the soaked millet and dal with turmeric powder,sambar powder,salt to the cooking veggies along with their soaked water,close the cooker with the lid and pressure cook upto 3 whistles. Meanwhile heat the ghee or oil in a pan, let splutters the mustard seeds,urad dal and asafoetida powder, add the cashews and curry leaves, fry for few minutes. Once the steam gets off, open the lid and add this tempered spiced and ghee, give a stir and finally add the chopped coriander leaves and lemon juice. Toss gently and serve hot with papads or any spicy side dishes. such a healthy dal bath looks vey tempting!! I'm loving all your fabulous recipes using these millets... i got to know how good they are and are trying to include them in our diet - this is fabulous! Yummilicious :) Looks sooooo tempting!! such a healthy n delicious meal Priya...millet bhat looks really yumm!! haven't tasted it, will try to get that millet soon! i am left with a pkt of organic millet and really puzzled with it.. made dosa.. but this is sure awesome n must try one.. looks like yummy sambhar rice.. I love fox millet, this is such a healthy preparation! Millet Rice looks so delicious and healthy. Wonderful preparation. Thanks for posting this recipe. Even I love foxtail Millet Priya... I will not get bored for sure...looks absolutely yumm and ur lunch menu makes me droollllllllllll. Absolutely mouthwatering dish dear!!! Perfecto! Delicious and healthy bath Priya. is foxtail millet different from the regular millet? I have only heard of thina payasam but i did not know u can make other thigns with it. You seem to be on a roll with the foxtail millet :-), nice idea with the dal bhath. Yummy bath..makes me hungry now..
Beautiful. And it looks like several of us who used millet to participate in the event fell in love with this grain: fantastic. Thank you so much for your contributions and for allowing me to host your lovely event.